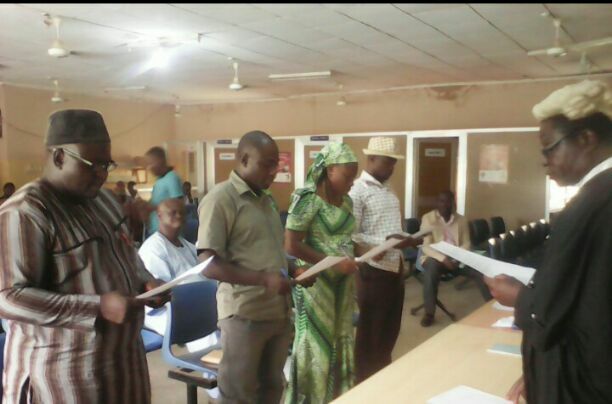 The Association of Medical Laboratory Scientists of Nigeria (AMLSN), Kaduna State Branch has elected new officers to man its affairs. Scientist Thomas Hosea Zagi, emerge the new chairman of the Association in the keenly contested election, haven scored 36 votes against his rival’s 35 votes out of 71 votes. Other victors are Stephen Olatunbusi who clinched the auditor ship with 46 votes out of 71 votes, Joy Clement got the financial secretary with 42 votes and Abdullahi Mairiga the secretary with 48 votes. The Chairman Electoral Commission, Scientist Yaro Dangode Jigo praised the conduct of the electorate, and urged all members to support the victors. Scientist Yaro thanked his colleagues for availing him and his team the honour to conduct the election. In his acceptance speech, the new chairman, Scientist Thomas Hosea Zagi while thanking the electorate, calling for a united front not minding their ethnic or religious affiliation to help move the Association forward. Scientist Zagi assured that he will work with every member as he thanked God for his victory. “We want to move to the next level and the new executives have plans to carry out activities that will help us to achieve our goals like improved medical laboratory to help us settle our scores with the doctors here and place us abreast with other laboratory scientists in the world. “Already a three man committee has been formed for the harmonization and to work as a team solving our differences for the society to better feel our impact,” the chairman assured. In the same vein, the immediate past chairman, Scientist Obadiah A. Sunday commended the members for their conduct, noting that the election was peaceful and transport. The Second National Vice President of the Association, Prince Ashiru Bati describing the election as free and advised the winners to commit themselves to their office as it is a clarion call to duty as well as ensure that everything possible is done to rub the Association well. He stressed the need to rectify grey areas and cement them to ensure that patients get the best treatment, disclosing that the Medical Laboratory Scientists of Nigeria intend to have a round table understanding with the doctors and the federal government to grant every citizen the opportunity to practice his profesion.